Speed-up utilities rarely seem to work as advertised. They generally tweak settings and clean things up nicely, but it's arguable whether the portions that sit in the background save you enough time to make up for the CPU cycles they use simply sitting there. Tweaking utility SpeedUpMyPC ($30, free demo), though, has some handy features--and in most cases, they seem to work. Bitmapped goodness, SpeedUpMyPC's interface is good-looking, but more important--well thought-out. 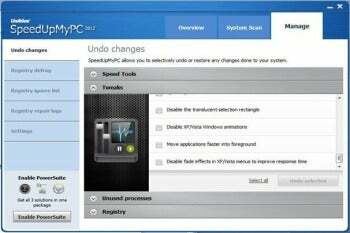 SpeedUpMyPC 2012's tools fall into four basic categories: settings tweaks, unnecessary process reduction, visual and launch optimization, and registry tuning. Tweaks (permanent settings that alter Windows' behavior) cover startup, shutdown and communications. Basically, anything that you can find when researching Windows performance tweaks on the Web has been included. The process reducer looks for processes such as umrdpservice (remote desktop printing) that are commonly unused and will disable them. Like the popular free utility CCleaner, SpeedUpMyPC 2012 has a registry checker that looks for unused or bad entries and removes them. Interestingly, SpeedUpMyPC 2012 found over 100 issues that CCleaner did not, but missed about 50 that CCleaner found. Unlike CCleaner, SpeedUpMyPC 2012 also has a defragger that eliminates any wasted space in the registry created by removing entries (which also happens with normal uninstall operations). SpeedUpMyPC 2012 has four real-time optimizing components: CPU manager, proactive thumbnail generator, Software launch booster, and Start menu accelerator. The first is supposed to prevent CPU hogging, the second creates icon caches, the third reduces application launch times, and the last reduces lag on the Start menu. SpeedUpMyPC 2012 is also part of Uniblue's PowerSuite which adds DriverScanner 2012 (which looks for outdated drivers), and the MaxiDisk 2012 disk optimizer. SpeedUpMyPC's tweaker, registry cleaner, and defragger are top-notch and the stars of the show--the background optimizers, not so much. Whether those utilities are worth $30 when there are free alternatives is questionable. System tweaker and optimizer SpeedUpMyPC actually works in most regards.